Launched in November 2007, Jango is a free online music streaming service that allows users to create and share custom radio stations. 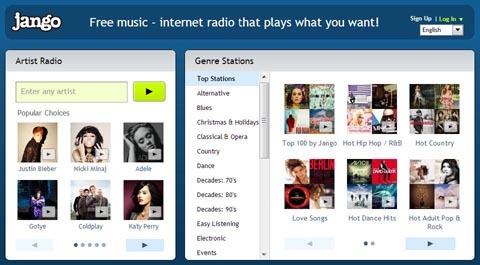 Users choose artists to stream, and the station plays music from similar artists. Users can further refine their stations by rating songs and artists in their feed to play less or more frequently. The service also incorporates social networking by “matching” users with listeners that have similar musical preferences. Users can share their stations or listen to stations created by others in the Jango social network. Jango’s business model is derived from advertising revenues and transaction fees from selling music through the site. There is currently no premium services available for the site.